Here we are, in Western Society, using chemically loaded soaps and detergents absolutely harmful to our health and environment when in India and most of Asia and Indonesia they're using a totally natural, cheap, and safe product called soap nuts to do most of their cleaning. Have we gone mad or what? Why isn't this product being made more widely known? I've only heard about it in 2007 and was shocked that such a product even existed. I always knew the popular brands of laundry detergent had way too many harmful chemicals in them and that they were adversely affecting my health, but here is a product that does the complete opposite! It seems we are being attacked on all fronts; not only through the food, water, and air we ingest, but also through the clothes we wear, or beds we sleep in. Phosphates and other chemicals used to clean or brighten our linen and clothes are breathed or absorbed by our skin and leached into our water and soil causing many ailments or diseases. It's time we woke up and realized how perniciously we are being lulled to our graves. The soap nut(sapindus) is actually a berry or fruit grown on shrubs or trees mostly in India and southeast Asia, but also in the southern United States and Mexico. There are several varieties, the most popular being sapindus mukorossi(India-Indonesia) which is becoming a popular alternative to chemical detergents among eco-friendly societies. 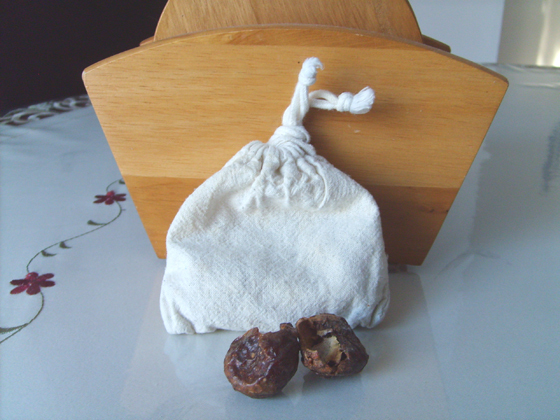 Soap nuts contain saponin a natural detergent which can be used to wash clothes and fabrics, as well as be used as shampoos, medicine, insecticide, and even contraceptives. It can even remove freckles! 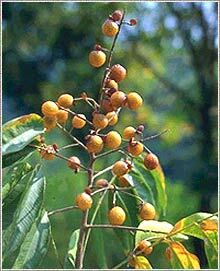 Soapnuts are anti microbial, and like aloe vera, have practically ulimited use. A few nuts are placed in a drawstrng cotton bag and thrown inside your washing machine with your laundry. The water(especially warm or hot) releases the saponin and cleans your clothes. The bigger the load, the more nuts are required. The good thing is they replace softeners as well and can be used several times before being discarded. Your clothes will come out naturally clean with no fragrance. They're also great for silks, wool, or other delicate fabrics. Tough stains may require presoaking or additional cleansing agents. The occasional black seed you may find in the nut can be used to grow your very own soap nut tree! For more information on soap nuts simply type in those two words on your browser and do a search.